Many areas of London have had their character damaged by the jumble of extensions and alterations to the houses, unsuitable windows and paved over front gardens. In the 1960s Brentham was starting to go the same way, but in 1969 it was designated as a conservation area by Ealing Council and given an “Article 4 direction” in 1976, removing virtually all permitted development rights. This means that almost all alterations have to go through the planning process. This control ensures that alterations do not damage the character of the conservation area and that our carefully planned estate with its beautiful vistas is not compromised by inappropriate “improvements”. Some alterations are given approval provided they preserve or enhance the character of the conservation area, and by walking around you will see examples of well designed extensions, loft conversions and other changes that have regard to the character of the estate and to the amenity of neighbours. What may be suitable for one house may not be suitable for others. You may also see inappropriate alterations made before conservation designation. Applications to re-instate original features or to improve earlier unsuitable ‘improvements’ are particularly welcome. We have been able to help in several successful projects of this type. Conservation Area status has enabled the character of Brentham to be preserved much as it was designed at the start of the 20th Century. 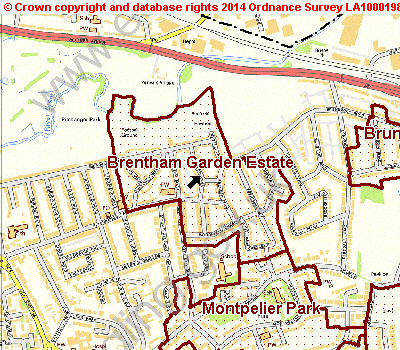 The Brentham Garden Estate Conservation Area is shown on the map below.